I have problems with a book styling itself as The Complete Asian Cookbook: indonesia malaysia & singapore (by Charmaine Solomon) because that’s not all of Asia, even if it is a part of Asia whose food I really enjoy. Oddly enough there are twice as many recipes for Indonesia than there are for Malaysia and Singapore, not quite sure whether Charmaine just couldn’t be bothered by the time she got to the Malaysian and Singaporean recipes, or whether given their geographical closeness and many common dishes, she just only included the dishes from Malaysia and Singapore that were unique. I could probably read the introduction to figure this out, but I’m not here for that, I’m here for the food. (By the way, as of posting this, the book is very cheap on Booktopia (link above) and I do recommend buying it). The recipes are mostly good, there were a few I didn’t cook because they didn’t make sense to me, nor to anyone else I cook with, and they need a complete rewrite. The recipes I did choose to cook though were amazing. An important note about chillies – some chillies are hotter than others, and when you buy chillies that are not even remotely hot, the dishes are delicious and you can eat more of them. (Ability to tolerate chilli is an individual thing). Overall I give this 4 out of 5. Sift the flour, ground rice, and baking powder into a bowl and add the salt, coriander, cumin, laos powder and chilli powder (if using). 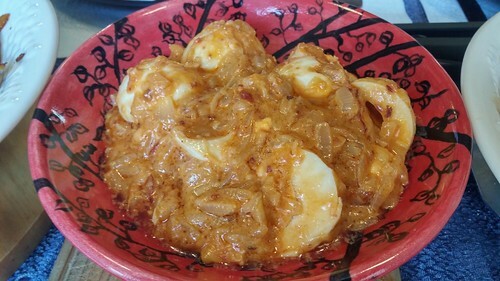 In a separate bowl, mix together the egg, shrimp paste (if using), lemon juice and 250 ml water. Add to the flour mixture, beating until smooth. Stir in the corn, onion, garlic, and celery until well combined. Heat the oil in a wok or large heavy-based frying pan over medium heat. Drop 1 large tablespoon of the mixture at a time into the hot oil, spreading it with the back of the spoon to make a circle shape with a 7.5cm diameter. 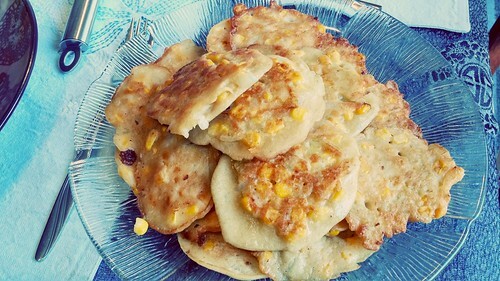 Cook until the fritter is golder brown on one side, then turn and cook the other side until golden. Remove from the pan and drain on paper towel placed on a wire rack. Repeat until all the mixture is cooked, then serve hot. We skipped the shrimp paste as we were cooking for vegetarians also, but included the chilli powder. This dish was great and there were plenty of fritters for everyone. Put the onion, garlic, ginger, chilli, nuts and kecap manis into a food processor and process to a smooth paste. Heat the peanut oil in a wok or large heavy-based frying pan over high heat. Cook the chicken pieces until brown. Drain on paper towel. Pour off all but 1 tablespoon of the oil from the pan and cook the chilli mixture for a few minutes, stirring constantly. Add the palm sugar, lemon juice, salt and coconut milk and bring to the boil. Reduce the heat to low, return the chicken to the pan and simmer for 25 minutes, or until the chicken is tender and the sauce has thickened. Serve with rice. This was so good I could eat it every night and never get bored. Or at least that is what we said when we cooked it. We only used drumsticks because that was the easiest amount of meat to get for that weight, it still worked. If you don’t have access to jaggery, you can substitute brown sugar. 3 hard boiled eggs, peeled and halved (we did 6 eggs, you could probably also do 8 if you needed). Heat the oil in a wok or large heavy-based saucepan and cook the onion and garlic until the onion is soft and golden. Add the shrimp paste (or salt if substituting), sambal ulek, laos powder and macadamia nuts and cook for a few seconds, stirring to combine. Add the salt, palm sugar, coconut milk and lemon juice and simmer gently, stirring constantly, until thick and oily in appearance. Add the egg halves, spooning the sauce over them. Serve hot or at room temperature. My mouth is watering thinking of this recipe, that is how good it is. 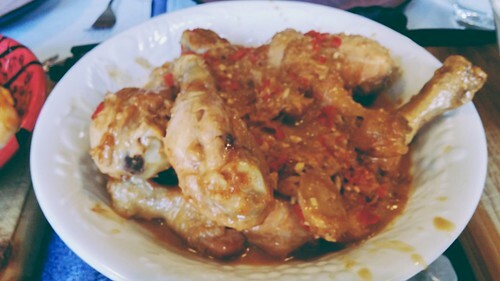 The author asserts that this recipe is a “very hot dish”, but she must have had some mystical hot sambal ulek that I didn’t have, as this was not even remotely hot for my household, and was appreciated by everyone at the table. Heat the peanut oil in a wok or frying pan over low heat. Add the chilli, onion and garlic and cook until the onion is soft and golden. 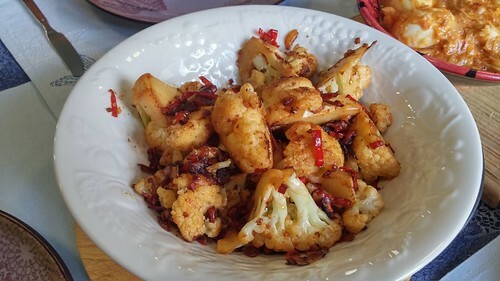 Add the dried shrimp paste (or salt), and stir-fry for one minute, then add the remainder of the salt, and cauliflower and toss constantly until the cauliflower is thoroughly mixed and coated with the spices. Sprinkle with 2 tablespoons hot water, cover and cook for 10 minutes or until tender, serve hot. I don’t like cauliflower at all, as I have said multiple times throughout this blog, and this recipe made cauliflower edible and moreish. Would totally cook again. Mix the coconut milk and water together in a saucepan with the salt and bring to the boil. Add the rice, stir and reduce the heat to low. Cook uncovered until the surface of the rice is dotted with little holes. Cover and cook for 7 minutes, then turn off the heat and allow to rest without lifting the lid for another 5 minutes before serving. 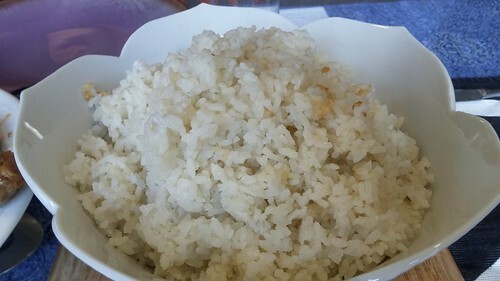 I have struggled to find a coconut rice recipe that actually works for me, and this one is good. It got a little golden down towards the bottom of the saucepan, but didn’t taste burnt, and cleaned up nicely.